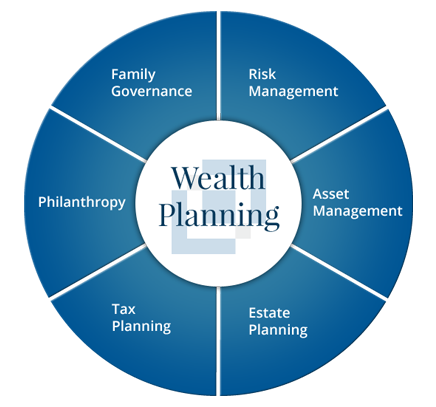 Our professionals have extensive experience in wealth planning, including graduate degrees in business, law and wealth management, and the leading credentials in the field of private wealth management (Chartered Financial Analyst®, Certified Private Wealth Advisor®, Certified Public Accountant, Chartered Financial Consultant, Certified Financial PlannerTM, Accredited Estate Planner®, Chartered Life Underwriter). We have the experience and the expertise to develop a comprehensive wealth plan tailored to your goals and to coordinate with your family’s legal and tax professionals, creating your wealth planning team. Our approach removes the barriers to integration and helps ensure that asset management, estate planning, risk management and family governance decisions are not made in ‘silos,’ but rather are made with the larger picture in mind. *Fiduciary, legal and tax planning/preparation services are facilitated via outside providers and referral relationships that are not affiliated with MML Investors Services, LLC. Representatives of Lau & Lau Associates, LLC & MML Investors Services, LLC do not engage in the practice of law, nor do they provide tax preparation services; you should seek the advice of qualified legal and tax professionals on all legal and tax-related issues. Chartered Financial Analyst® is a registered certification mark of the CFA Institute.